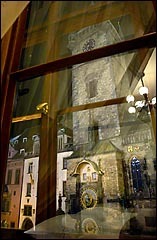 Grand hotel Praha and its sister hotel Apostolic Residence are the only two hotels offering a magical view of an unique historical sight - The Old Town Astronomical Clock from its windows. 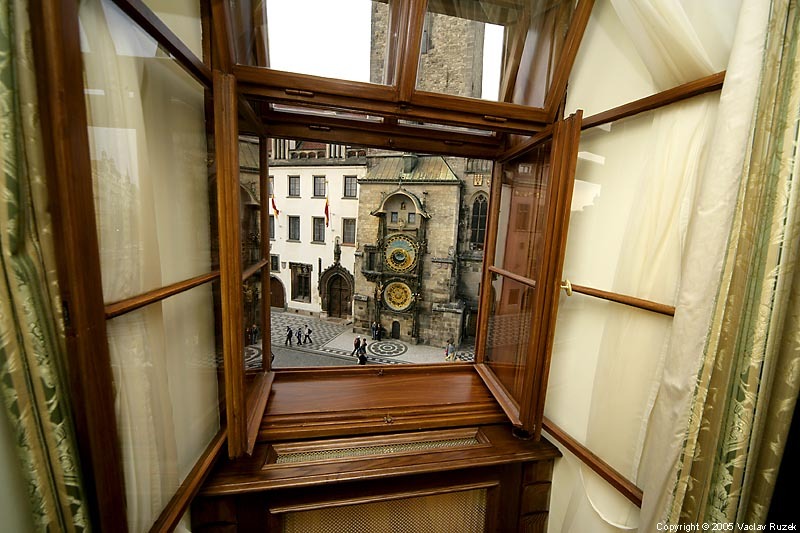 Grand hotel Praha and its sister hotel Apostolic Residence are the only two hotels offering a magical view of an unique historical sight - The Old Town Astronomical Clock from its windows (you can look at the webcam). 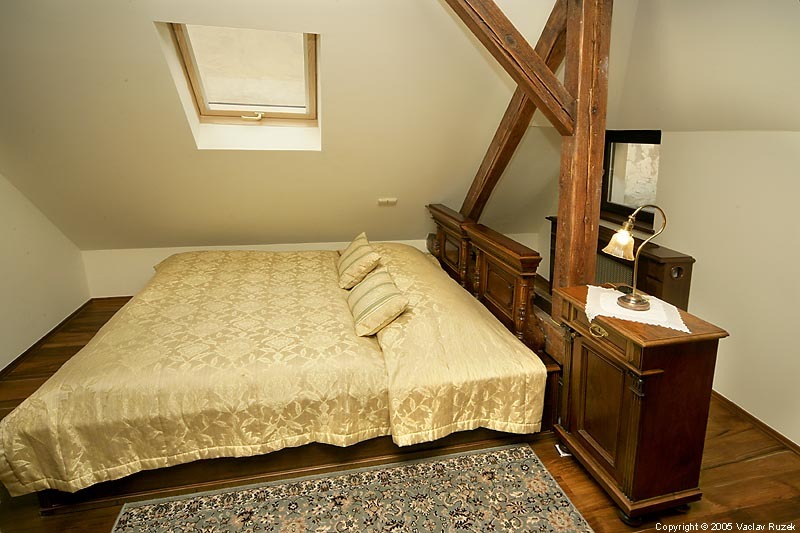 It enjoys a superb location directly in the heart of the Old Town a short walk from many sights & monuments, theatres, exhibition centres and shopping areas. 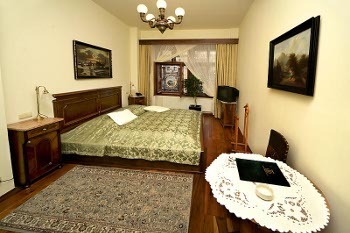 The recently refurbished Grand hotel Praha offers high standards of comfort and a friendly environment. 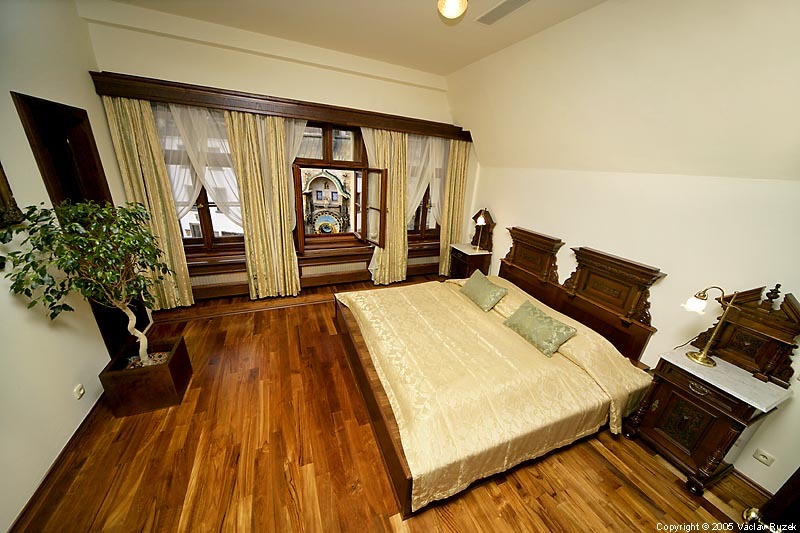 Every room and suite is exquisite and designed to provide exceptional standards of comfort. 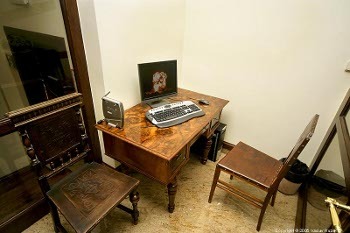 All the rooms have been individually decorated and equipped with beatifully restored antique furniture. 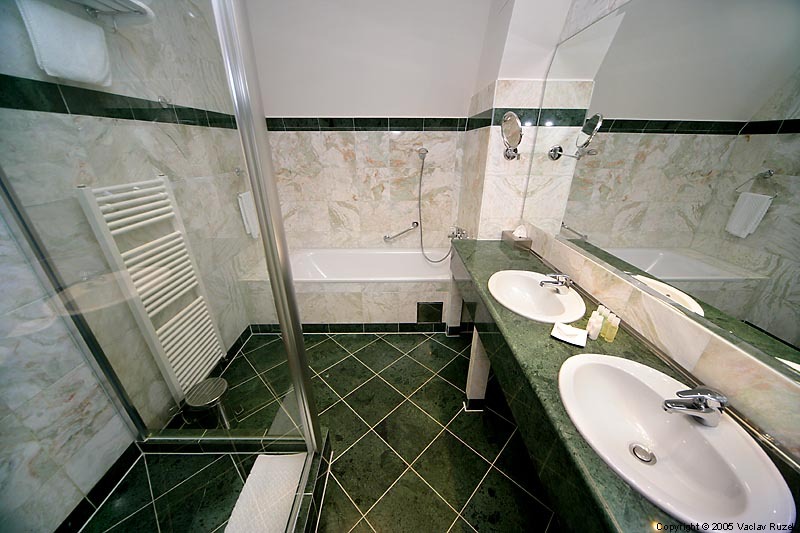 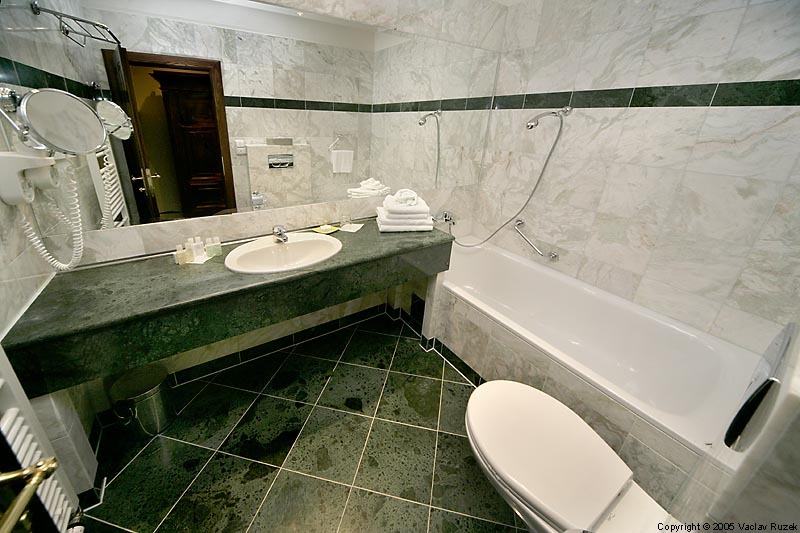 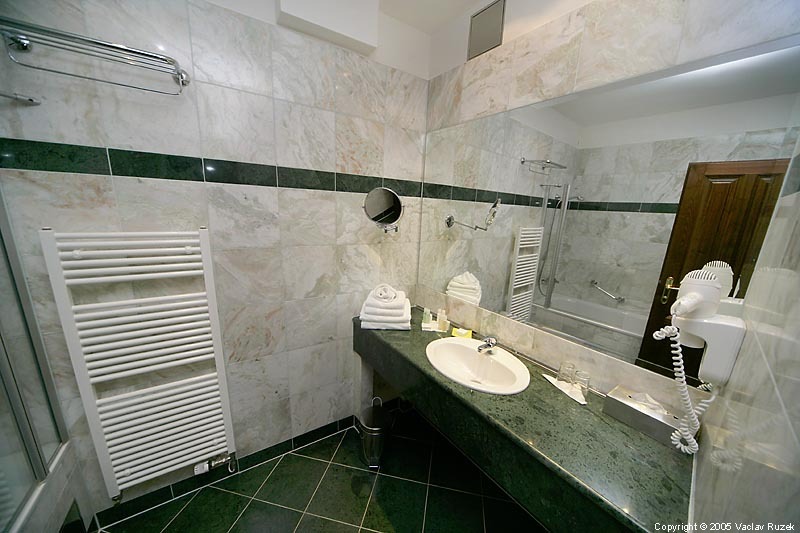 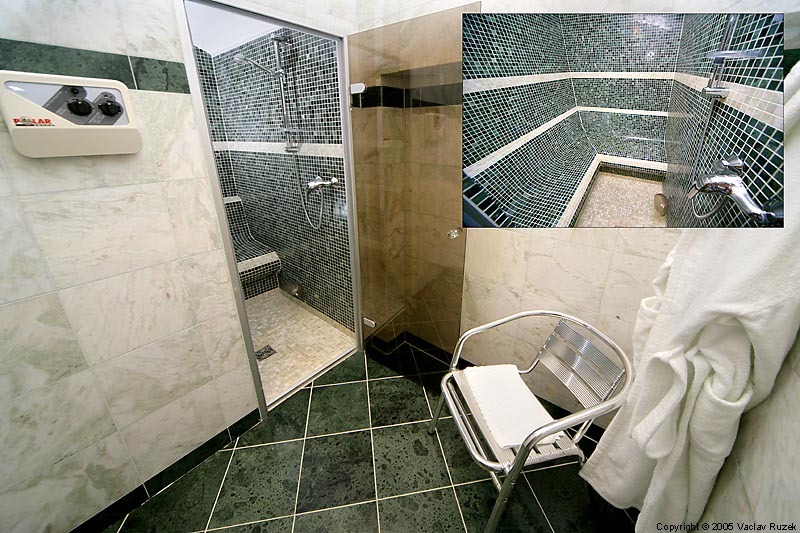 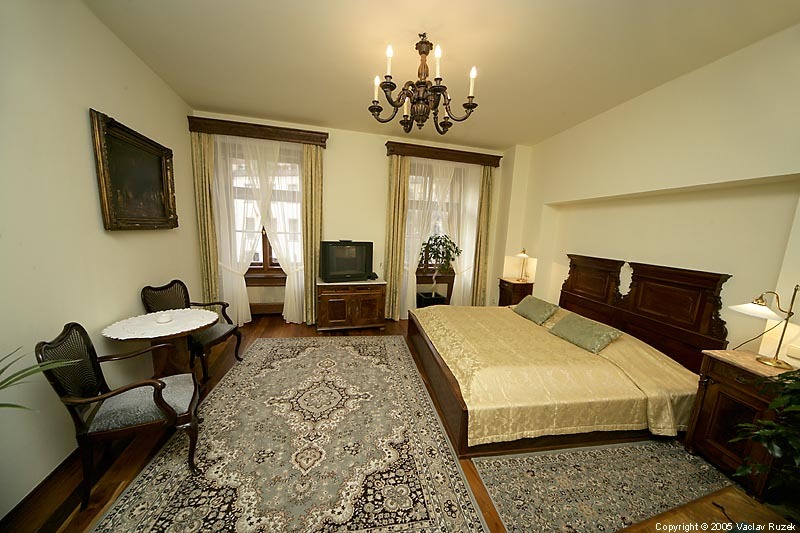 Grand Hotel Praha consists of 20 rooms: 18 double rooms, 1 single room and 1 Presidential Suite. 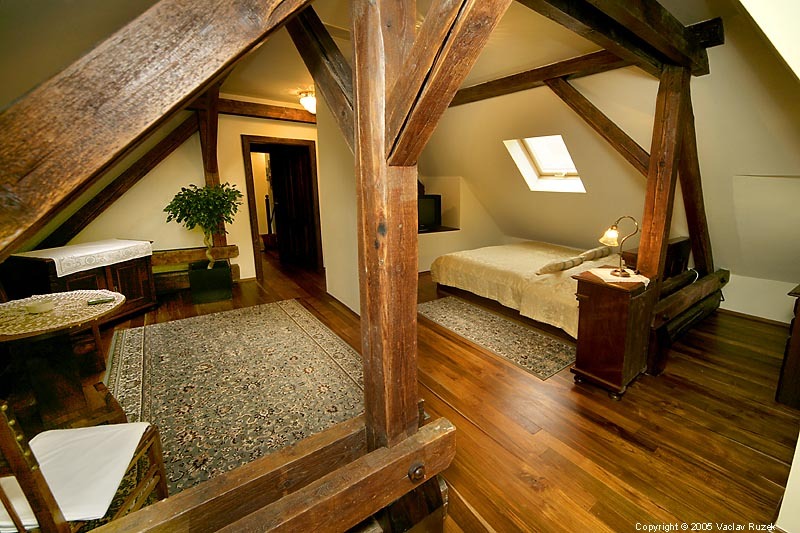 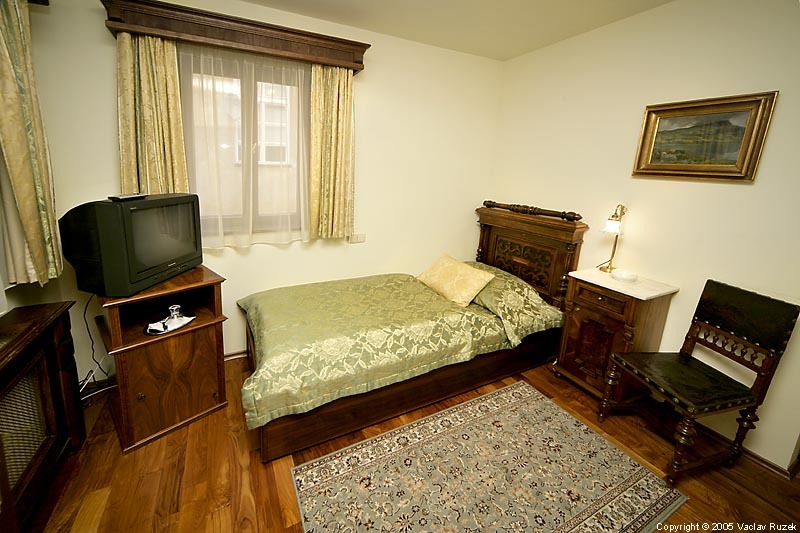 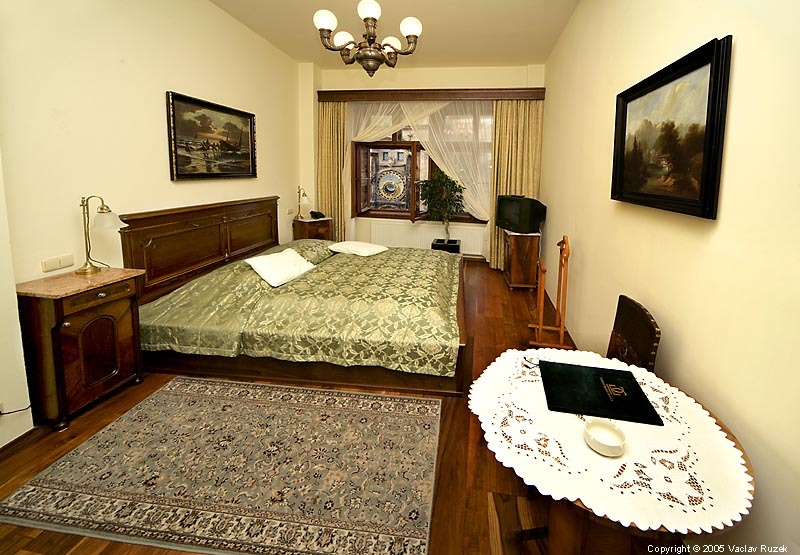 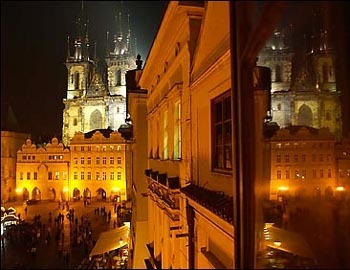 Eight double rooms and the presidential suite offers direct view of the Old Town City Hall with the Astronomical Clock. All twenty rooms have benefits of the most modern facilities: en-suite bath and/or shower, hairdryer, bathrobe, cosmetic mirror, cosmetic set, air-conditioning, TV with satellite channels, direct dial telephone, in-room internet access, electronic safe and minibar. The Presidential Suite is equipped with double bed, bathroom with bathtub and shower, toilet, bidet, hair dryer, spacious clothes room and private finish sauna. Bedroom is separated from the living room by a glass door. 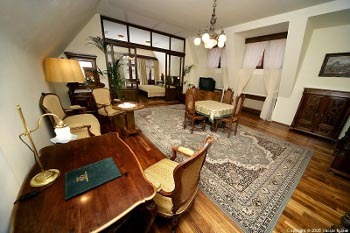 The living room which is suitable for private as well as business meetings is furnished with writing-desk and dining table, seating furniture and coffee table. 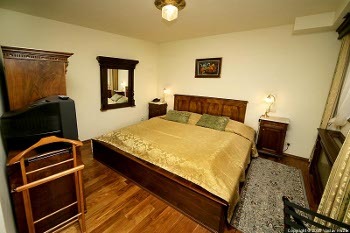 There are also two SAT TVs, minibar, telephone, electronic safe, in-room internet access and air-conditioning. 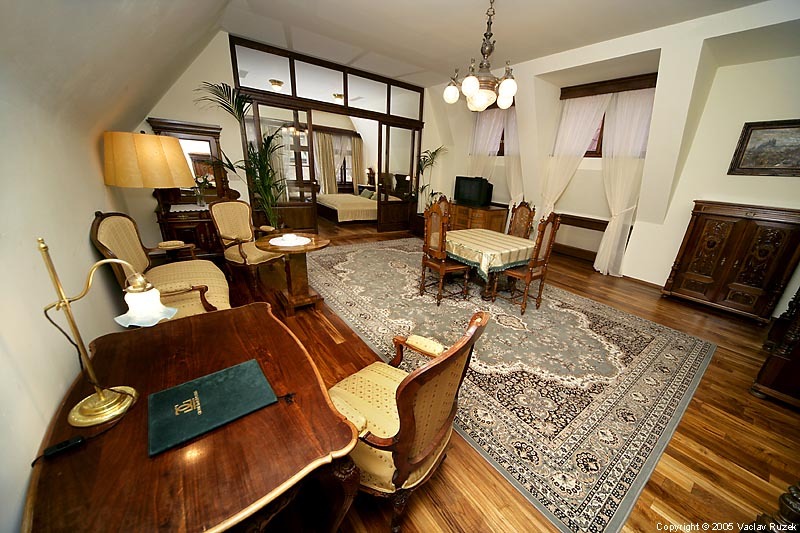 The staff of the Grand hotel Praha is constantly striving to improve and enhance the services we provide to our guests. In the hotel there is an elevator to take you up to your room. The reception service with concierge desk and currency exchange is available 24-hours. 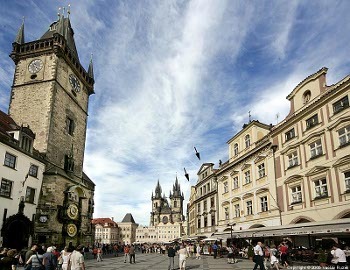 Our deluxe buffet breakfast is served from 8.00 a.m. to 11.00 a.m. at Grand Cafe Praha on the first floor. 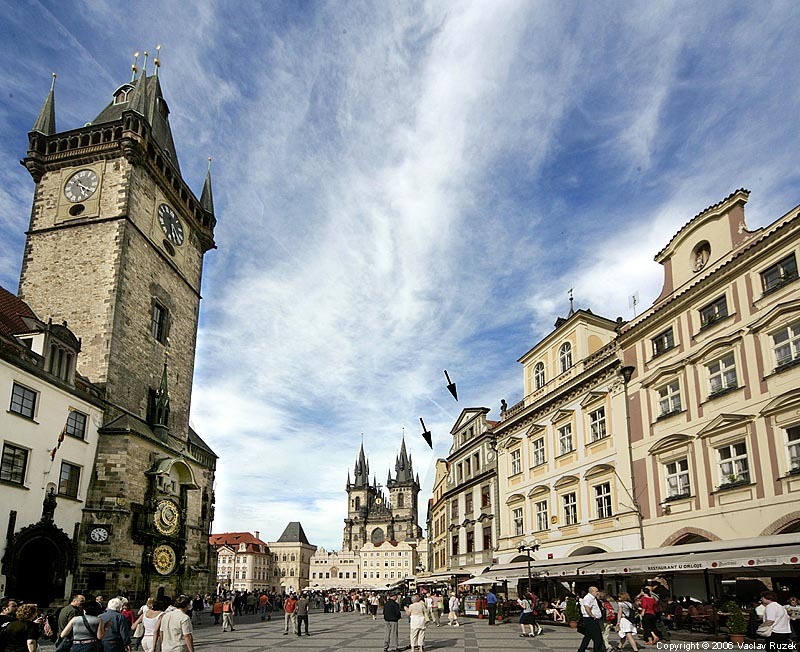 A wide range of tempting dishes is prepared in the tradition of the finest Czech or international cuisine and it is to ensure that you will enjoy the very best in taste and quality. 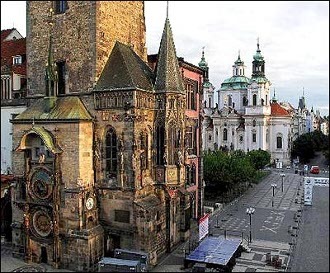 If you need a parking place for your car we can book a place in a closed courtyard 100 metres from hotel (across the Old Town square) - it cost 25 € and must be booked in advance. Prices are for double occupancy. Other persons have to pay for an extra bed. 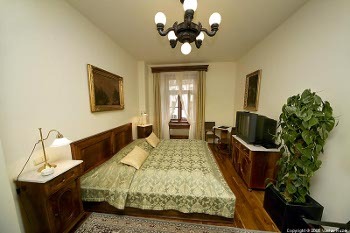 Prices include breakfast, all taxes and free entrance to hotel sauna. 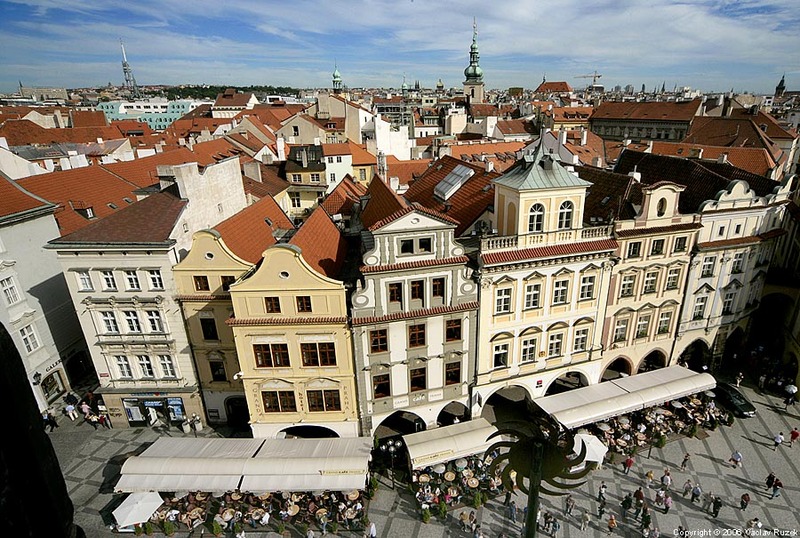 But do not include city tax 15,- CZK person/day. 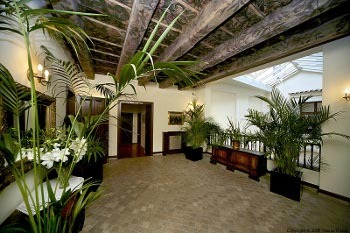 Price also includes our Grand Bonus Card which entitles you to various discounts - see below. Ask us for discounts for stays from three nights or more rooms.